For example: Unger's system is build on the terms 'love', 'peace', 'wisdom' & 'service', which are described to represent the main principles of 'life purpose'. However, there is no religion or philosophy where these terms (or likewise) terms play a key-role. And one should also be aware that the most people have a need for 'love' and 'peace'... so for most people it is very easy to identify with such words. Therefore one can argue here that P. T. Barnum's observation "we've got something for everyone" might also apply to those 4 key-words in the 'life purpose' philosophy. I cannot agree more. I am currently taking Richards Certificate program for hand analysis and I comming across the same issue as you discribed in your example. From my observations Richard's system is very vague and oftenly based on "readers choice". therefore using terms that can relate to most people. Even in hand shapes (that I am learning now) I found many inconsistencies that once again come down to "readers choice" and feel. Thank you for sharing your experience with Richard's program. Maybe you can add a specific example to illustrate the inconsistencies' that you got confronted with inside the Certificate Program program? yogiman wrote: The thing is, that I want to get clear what it means when a handshape is watery (etc. ), versus the skin texture that is watery, versus lines that are watery, versus fingertips that are watery. I like to keep things as simple as possible and free from elemental bias, if this is in line with the reality of the hand. yogiman wrote: When A is part of B, it is not so that A = B. I see no reason why a "water" hand should point to all traits and characteristics that can be associated to the element of water. It might make the discussion unnessarily complicated, because we have to "squeeze" the hand in one of the four categories, and on top of that have to see which of those characteristics can be maintained due to the neutralizing effect of skintexture, lines and fingertips. Start with thinking about what the various hand features represent. Handshape is the element of expression, our basic energy, how we express our energy out into the world. Skin texture is the element of impression, what we take in from our environment, what kind of environment suits us. Lines - well I'm sure you know that our lifeline (earth line) is like our path through life and also an indicator of our physical energy. Headline (air line) is about our way of thinking. Heartline (water line) about our emotional & relationship needs, ways of relating. Whichever element each feature is assessed as, is the manner in which they use that feature. Adding up all the features doesn't neutralize the basic handshape, it may modify the way they use it, but it adds extra dimensions and combinations of elements to build up a picture of the person. I'm not sure if I've made this clear or if it has answered your question? yogiman wrote: We are presented in the books with very elaborate descriptions of the elementary handshapes, suggesting that about everything that can be associated with an element is in the handshape. But is this true? In order to get at four elements we look to the handwidth (square vs. oblong) and the fingerlength (short vs. long). A square palm connotes order and stability, and an oblong palm: creativity and responsiveness. A short finger: being quick and the main lines, and a long finger: being slow and detailed. Intuitively we observe that a square palm and short fingers belong to the element of earth (the workman's hand), and that the oblong palm and long fingers belong the element of water (the artist's hand). But instead of an entire array of character and physical traits, what it actually says is that the first one is about order/stability and being quick/main lines, and the latter about creativity/responsiveness and being slow/detailed. With the air and fire hand there is no such intuitive association, though it can be comprehended: air refers to order/stability and slow/detailed, which reminds us of method, and fire refers to creativity/responsiveness and quick/main lines, though responsiveness is related to water. I tagged handwidth and fingerlength both with two attributes, which in combination gives four attributes for every type. As I outlined, those 4 attributes together do suggesth one of the four elements. I'm not sure about the attributes you have chosen for each element. I see some confusion. First of all, we are talking about handshape, so forget about the lines for now as that could confuse matters. Yes "In order to get at four elements we look to the handwidth (square vs. oblong) and the fingerlength (short vs. long)" (NB we are also looking at the palm length to ascertain palm shape, square or oblong). Basically, the palm represents the body, the fingers represent the mind. The longer the fingers are in relation to the palm, the more time the person spends in their inner world of thoughts (air) or emotions (water). The shorter the fingers are, the more the tangible, physical world predominates and they like hands-on contact with the world (earth) and like to be active (fire) - "do-ers" rather than "thinkers". OK this is just a brief explanation. A square palm connotes order and stability, and an oblong palm: creativity and responsiveness. A short finger: being quick and the main lines, and a long finger: being slow and detailed. I'm not sure where you got this from? Square palm in an earth hand like order and stability which are earthy characteristics, but the same can't be said of the square palm of an air hand because in an air hand the fingers predominate. Think of the element air in nature, it is not stable or ordered, and it usually moves fast not slow! I don't know what you mean about "A short finger: being quick and the main lines". Short fingers do tend to think more instinctively and see the bigger picture without analysing the details. "And the main lines"...what about them? (edit) fire is a fast element, but earth isn't. 'responsiveness' - again, I'm not sure what you mean. All elements respond to something in their environment. e.g. Water respond to people & emotions, fire responds to actions, air responds to thoughts/ideas, earth responds to the physical material world and nature. Sorry if I have misunderstood anything. Has my reply made sense to you? Well said Lynn, I fully support your perception that the 'lines' should never get associated with 'hand shape'. Here are some examples that I found very confusing while learning Richar's system, especially for hand shapes.Picture above shows Earth Hand from Richard's system. Basically it is not nesessary the shape and size of the palm and finger, but the complete feel of it. Chancky palm with chancky fingers (that are on the shorter side) would be and Earth Hand. Based on the Richard's system that I am learning now, skin texture and line quality are not determening the hand type. I am only taking a Certificate Program and not a Master teacher program, so I am sharing with you what I have been learning there now. Water type - Palm is long and nerrow (top and bottom). Palm should not have too much flesh and appear as a nerrow ractangel as a whole (including fingers). Fingers are long, skinny and seaweed looking on the prints. Thanks Helen useful to see how they classify the hands in Richard's new system, and good to know that they do not use skin texture & lines in the 4 classic handshapes. Thanks for sharing that Helen! Earth: Square palm, few lines, short fingers. Solid, reliable, feet on the ground. Air: Shoebox shape, long fingers and lines. Mental observer, seeks to understand. Water: Long, narrow palm, lots of thin lines. It is a matter of fact that life arose from the ocean at the beginning, and the foetus in the womb is an analogy. Maybe water-creativity refers to originality and arts, and fire-creativity to practical appliance. Lynn wrote: a)A square palm connotes order and stability, and an oblong palm: creativity and responsiveness. A short finger: being quick and the main lines, and a long finger: being slow and detailed. b)Square palm in an earth hand like order and stability which are earthy characteristics, but the same can't be said of the square palm of an air hand because in an air hand the fingers predominate. a)How to read any palm:"Short fingers are a sign that thought processes are fast and holistic..."
b)With air I (and you too) associate the thinking faculty. By -thinking- we rationalize the world around us. The element of air in the I Ching is represented by the trigram -sun-, which means -wind, the gentle, subtly penetrating-. It is stable in the sense that we cannot alter it's course. And yes, it is ordered, but as long as it flows in a straight line. As a matter of fact, wind is a phenomenon brought about by temperature difference because of the sun's (fire) working. Likely, air is to be viewed in it's abstract sense. Maybe it is word jugglery, but -to respond- is re-active, like water is bouncing back. Lynn wrote: Start with thinking about what the various hand features represent. Basically, the palm represents the body, the fingers represent the mind. The longer the fingers are in relation to the palm, the more time the person spends in their inner world of thoughts (air) or emotions (water). The shorter the fingers are, the more the tangible, physical world predominates and they like hands-on contact with the world (earth) and like to be active (fire) - "do-ers" rather than "thinkers". Now we are talking, this is clear. Maybe we could focus on handwidth and fingerlength instead of the elements. The ancient chinese philosophy is more concrete than abstract, contrary to the old western philosphy. Their elements have been associated with forms from the beginning (e.g. feng shui), and the five shapes are also applied in chinese face reading. So there is a metal face, and a metal hand, and both refer in their own way to the element metal. And someone with a metal face doesn't have necessarily a metal hand. As far as I have seen on the internet, from the handshape one looks what profession is most suitable. In western face reading there is no earth, air, water or fire face, and we could ponder why in thousands of years of face and palm reading the masters in the trade didn't get the insight. I question how much evidence there is that the elemental assignment gives an elaborate picture of someone's characteristics. Not exactly yogiman, at NASA they believe that it was 'electrical energy' at the sea floor where life on earth began... which again shows how creativity relates to more directly fire/electricity. This sort of also explains why fire is the most 'energetic' of the 4 classic elements, as fire is the most dynamic/unstable/lifely element. And make no mistake: each of the 4 hand shapes has it's own form of 'creativity', so that is not limited to fire and water (the creativity of the earth hand shape can be associated with things like: agriculture, making a nice garden & building houses; while in air hand shape the creativity manifest in for example: creating ideas, finding solutions for problems, etc.). I question how much evidence there is that the elemental assignment gives an elaborate picture of someone's characteristics. We could ask the same question about any school of palmistry. There is almost no (scientific) "evidence" that any type of palmistry works at all! There is no more evidence to suggest that the ring finger is ruled by fire, than that it is ruled by the sun, or by Apollo. They are just symbolic languages, ways of looking at hands, that give us a vocabulary to describe and interpret what we see. Fire and water are represented by sun and moon. Both are "heavenly", as is creativity. In the chinese 8 trigram diagram spring time starts indeed with -chen- (thunder), but -kan-(water) is called the gate of life. Without doubt NASA is right, and electricity (fire) is responsible for life on earth. However, what is true for earth is generally obversely true for heaven/spirit. For example, hands for labour that reveal the deep mysteries of the human being. You should have heard that artists are more creative during the night or during full moon. Nonetheless, I do accept a draw. The thumb is free, which refers to the will. With the index finger we give direction, which refers to authority. The ringfinger is most often ornamented, which refers to show off. The middlefinger balances the will for power and the desire to shine by focussing on responsibilities. The little finger is most quick and resembles mercury as smallest planet. The lower side of the palm is earth related, the upper side heaven related, the thumbside of the palm is about the individual, the ulnair side about the collective and unknown. I don't want to discredit the elemental approach entirely, but I question it's practicability. There should be a great deal of realism in palmistry, because there is a supreme intelligence, because lots of intelligent people are drawn to it, because it has a worldwide tradition for thousands of years. Yogiman, in terms of the Chinese philosophy 'life' is actually represented by the 'qi' concept, which is according science today associated with Oxygen related metabolism processes. Even though the element Oxygen is included in water (H2O), and Oxygen is required to make fire burn... 'qi' goes beyond the elements, therefore I think we should not confuse 'life' with creativity, etc. Just to avoid that we drift further away from what you had in mind, I would welcome you to make a new attempt to (re-)formulate your initial thoughts about the intuitive perceptions that we can have regarding earth and water. Okay? Thank you for your efforts so far! I don't want to discredit the elemental approach entirely, but I question it's practicability. You are not alone, many people question it's practicability - but they are people who haven't studied the element system! I'm not trying to convert anyone to the element system, it works for me! Thanks for your interest. I know from experience that it is very difficult to be objective about something, that you have put a lot of time and research in. And I will not please you in asserting that my only positive observation is, that only in the extreme cases of the earth hand (most compact)and water hand (most fragile) I think I can relate them to their element by their form. My girlfriend has got a spatulate hand, and her hand is just ignored. I read that palmistry was imported by the ancient greeks from china, and maybe we should not ignore those roots entirely. Maybe it is a good idea to explore the chinese elemental system for handshapes. I have searched on the internet, but could not find very much about it. Okay, I understand your association regarding the 'compact' versus 'fragile' association - yes, I think this makes sense (though maybe we will find better words). Very neat. But not enough to seduce me. This answers more to the shape, and is also more complete. Unfortunately there are no members from china on this forum, but I still hope I will get positive and knowledgeable feedback on this, as I am just an inexperienced speculator. I think that the meaning of handshapes according to the 4 elements system has to be narrowed down, as face reading should give more away about the person you are. According to chinese tradition the handshape points to the profession that suits you, but this I would like to broaden into the way you do things. It is open for debate how much this says about yourself. yogiman wrote: Very neat. But not enough to seduce me. A 'round' palm...are you kidding? Such a palm shape basically does not exist at all... I think you have just presented some conceptual associations without presenting any specific clues regarding how to recognize those various palm shapes in practice. And I think you are making various fundamental mistakes here by starting an effort for the palm without any consideration of the fingers at all, and hand shape interpretation should not get mixed with the issue regarding how to recognize the physical characteristics of the individual hand shapes... unless it would be build on some rock-solid observations. Actually, the more we have progressed in this topic... the more vague your associations became - also, you didn't proceed with your 'earth-most compact' & 'water-most fragile' associations. So, after reading your last post I am beginning to wonder whether there is anything 'solid' in your ideas at all...or just associations??? Because I haven't seen any argument at all regarding the 'choices' that you proposed. Well, a rounded hand. I saw that Einstein had one. The problem that I have with this four element system, is that there is not so much surety about it, while it sets the tone for the rest of the features. You just have 2 variables, with each two sizes, which equals in number the elements, which is no big deal. It's nice when you can see allover the hands the signature of the 4 elements, but I think the elements should be kind of memory aid, and not a grid to force the interpretations into. This topic seems so important to me, that I rather go seeing what an old tradition is saying. 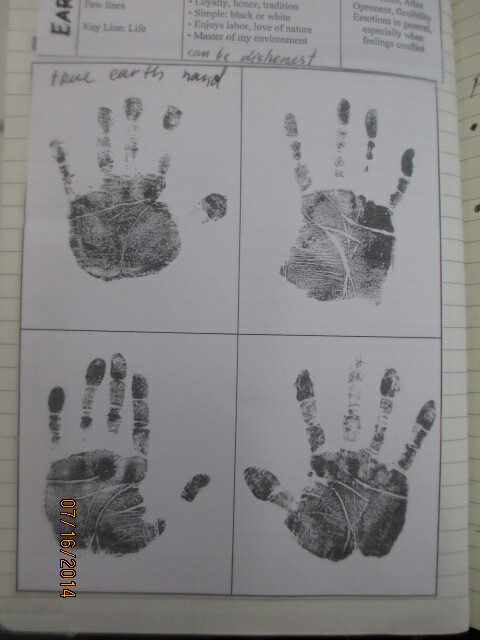 yogiman wrote: Well, a rounded hand. I saw that Einstein had one. Nope, there are actually three variables: FL, PB & PL, which each tend have a unique ratio towards the other two... but I can understand that the proportional formulas make things look at first sight that there are only two variables. For example: even though finger length can be defined in terms of the Fl/PL ratio... the FL/PB ratio is actually also required to study 'overall' finger length properly. However, for the objective to assess 'hand shape' this is sort of an irrelevant issue (because 'overall finger length' is not really necessary to find a correct 'hand shape' assessment). Regarding the 'old tradition': sorry, I am not sure what you exactly have in mind. I think the oldest traditions regarding elemental hand shape date from the 20th century (starting with the works of the authors Gettings & Dukes separately - but their guidelines include the same lack of specificity that made you create this topic... so I expect that the 'old tradition' will likely not help you out. Actually, I could describe your latest move - by putting your hope focussed on 'old tradition' - as a shift towards... nowhere, because you are referring to nothing at all. You basically just walked away. Anyway, thanks for your input so far at this forum! PS. 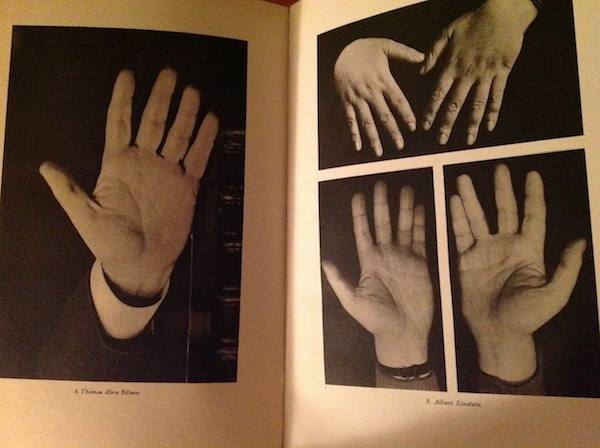 In the photos of Einstein's hands I see nothing that I can associate with a 'round palm' (see the photos on the right below); you probably made your association from a 'cut with cissors' version of his handprints... which made his hand misleadingly look like it had a 'round' shape - while the picture below (+ other versions of his hand prints) show that this is not the case at all: Einstein didn't have 'round palms'. I think the elements should be kind of memory aid, and not a grid to force the interpretations into. I'm not sure what you mean by 'a grid to force interpretations onto' ? But I agree that the elements ARE a kind of memory aid. Once you understand the elements, and you know how they are ascribed to hand features, it means you don't have to remember all the varied possible interpretations for each hand feature such as the lists that appear in many palmistry books, you only have to observe how the element is working in that feature. The problem that I have with this four element system, is that there is not so much surety about it, while it sets the tone for the rest of the features. Sorry yogiman, can you say this in another way please / expand on it, as I don't understand what you are saying. Traditional Chinese 5 Hand Types. 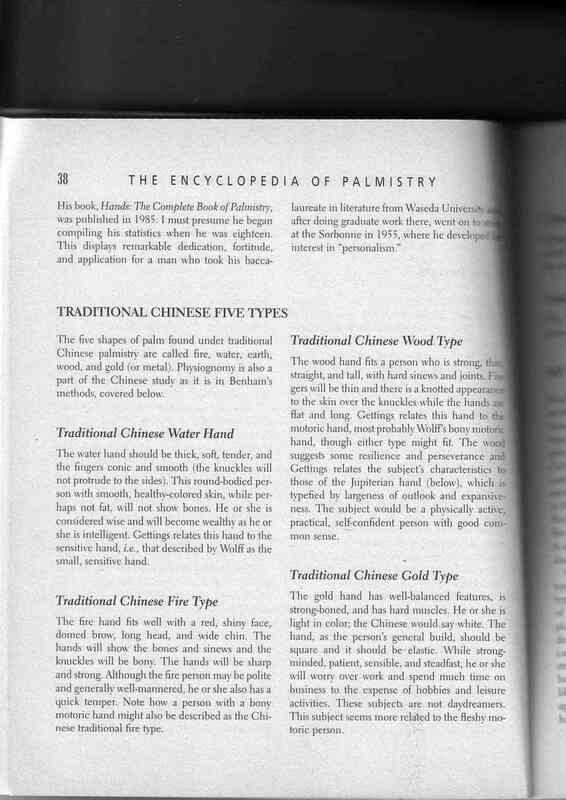 Yogiman I've scanned for you the pages that Martijn spoke about earlier, from Ed Campbell's "The Encyclopedia of Palmistry", P38 & 39 where it refers to 'Traditional Chinese Five Types'. Sorry for the late reply, but I feel terrribly lazy at the moment.Thanks, Lynn, for taking so much effort, but I have to disappoint you. The metal hand should be the most materialistic of the whole bunch, and is described as the psychic hand of the sevenfold system. I get the impression that Gettings wanted to discredit all other systems for handshapes, before promoting his own one. I really would like to support you both, but honesty prevents me from it. I still think that the rounded and spatulated handshapes should be included. Maybe the system of d'arpigney should be refined, not in the least because it is including the 4 archetypes of the handyman, philosopher, artist and psychic. You could object that this is represented by the elements of earth, air, fire and water respectively in a broad sense, but my feeling is that the former is designed on basis of observation.